Ghostly greetings from PartyCheap.com! Looking for a little party favor for all of your guests? 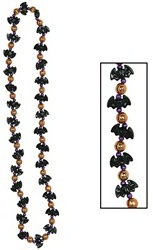 Halloween Beads and Necklaces are perfect for a affordable fun party favor. Have your guests wear their necklace for the party to add even more decoration to the party. Or maybe you need some of the Halloween Beads for a costume. These will do the job for you no matter what costume you are wearing.